It takes some cheek for the PM to deride Corbyn's decision not to meet her. The rage has been mounting over Jeremy Corbyn’s refusal to meet the Theresa May. Labour MP Mike Gapes said he’s been ‘happy to talk to Hamas [but not] the Prime Minister’. Tory MP James Cleverly mocked Corbyn for wanting to speak to the PM in the past and refusing now. Meanwhile, backbenchers refused the Labour leader’s request not to see May and visited her anyway. Tweet after tweet argued he should ‘keep the pressure on her’ rather than ‘put his own ego before his country’s citizens’. All of this could be true. All of it misses the point. 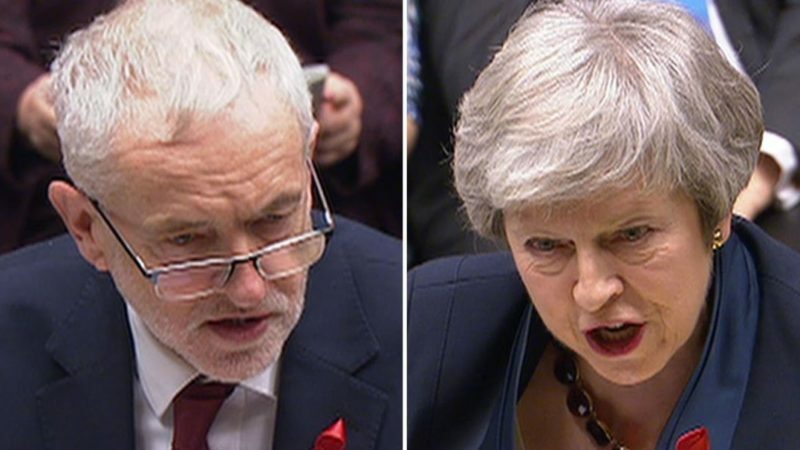 Opposition party figures have been pouring through the doors of Number 10 to press their case to the PM: for a ‘People’s Vote’, for taking no deal off the table. On Wednesday, Plaid Cymru Leader Adam Price , and Plaid Cymru Westminster Leader, Liz Saville Roberts met her. They emphasised the need to avert no deal and for there to be progress on a so-called People’s Vote. They told her the only way the PM can maintain her negotiating “red lines” is if she supports a referendum which would ratify or reject her deal. On Thursday, Caroline Lucas raised her concerns for the rights of EU citizens in the UK. Pushing the case for a second referendum to get through the gridlock. Calling for more democracy. After a result that was very close by referendum standards, there has been basically no attempt in two and a half years to reach out to Remainers, opposition parties, or even the public. Rather than using last year’s general election as a chance to listen, she instead desperately embraced the hard right via the DUP to shore up her position. She has held dozens of meetings with big business over the past two years. How many times has she met with union leaders representing millions of British workers? I can’t find a single reference – until last week, when she called Unite’s Len McCluskey and the GMB’s Tim Roache. It took two and a half years to speak to figures representing over six million working Brits. She has only met the leader of the TUC once during her tenure as PM. She has long ignored opposition party calls for cross-party Brexit talks – despite voters saying they’d support such a move. While calling for talks, she has already ruled out any compromise over the key issues at stake. This is a PM who appears willing to listen only in the face of abject defeat. The word ‘appears’ is crucial here. No one appears under the illusion that the PM is willing to give real ground over her Brexit deal. She has refused to take no deal off the table. Her party is endlessly mocking calls for a ‘people’s vote’. To now have the cheek to say she is ‘disappointed‘ by the Labour leader’s refusal to meet only emphasises that this is a Prime Minister out of touch with reality. The spat over meeting the PM is a sorry side-show. The real problem runs far deeper: Westminster’s hostility to real dialogue. Except for when it’s too late.